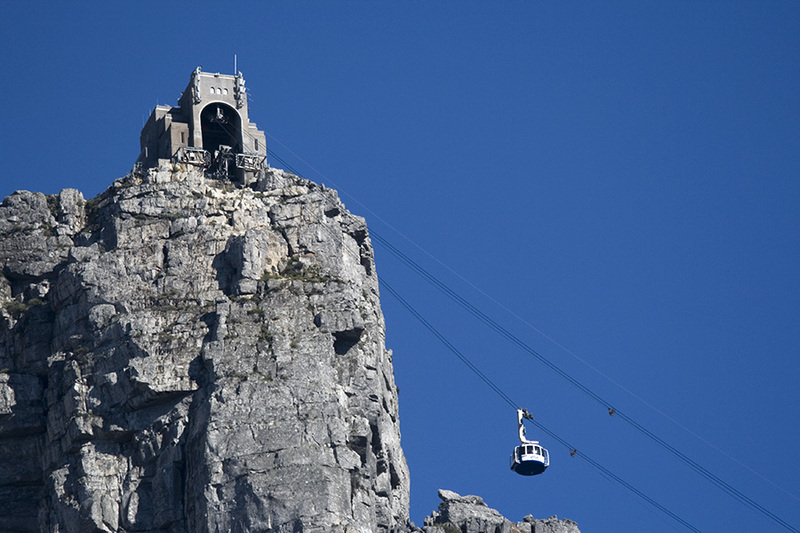 About twenty years ago my parents took my siblings and I up Table Mountain in the predecessor of this cable-car. It was a far more rickety ride than the one in this photograph. I remember standing on the edge of Table Mountain, looking down at clouds below and having a strange feeling that I wanted to jump down into them - they looked like so much fun. I wonder how many people get that feeling when looking down on clouds? The cable-way underwent a complete upgrade in 1997. The first time I took a ride in the new cable-car was a few years ago when Kerry-Anne and I joined a few friends to hike up the mountain. By the time we reached the summit it was getting later in the day and some of our party didn't feel up to the climb down. We bought one-way tickets down the mountain. The ride down was much quicker than the climb up! The 360-degree views from the rotating cable car were awesome. We have other more exciting stories about climbing the mountain in the rain and lightning... but let's leave that for another day, shall we? Posted in General on Friday, 15 June, 2007 by Paul.